Hundreds of young people, youth workers, teachers and supporters from across England and Wales, gathered in London's Leicester Square on 1 July, for the inaugural Celebrating Young People Awards, organised by Million Minutes. They were welcomed by Baroness Hollins, who earlier in the day had hosted some of the young people at the House of Lords for high tea and a set of workshops to support them in their work for social justice. Baroness Hollins said: "In a society that often overlooks young people, we need to take time to celebrate them. We can't award everyone, but we are celebrating everyone. Those receiving awards are doing so on behalf of the many others working with a similar passion and commitment to build a more just and peaceful world - a world where all of God's creation, including all people, can flourish." Awards were made in eight categories, based on Catholic Social Teaching: including celebrating human dignity, care for creation, the protection of workers, promoting solidarity and peace, fostering community and living out the option for the poor. Cardinal Vincent Nichols gave the Pope Francis Award to Ryan O'Neill a psychiatric nursing student from Merthyr Tydfil who, in his free time works tirelessly supporting and inspiring young people. Ryan (pictured below with Cardinal Nichols and Danny Curtin) will now make a tailor-made study trip to South America to trace the footsteps of Pope Francis. As he gave the award to Ryan, Cardinal Nichols recalled that another Archbishop of Westminster, Cardinal Manning had intervened to end the Dockers' Strike of 1889 - before Catholic Social Teaching had actually been defined. The Cardinal said that Mr O’Neill exemplified the same good virtues as Pope Francis, and urged the young people to use Pope Francis as a role model. He told the audience, Pope Francis said 'reality is more important than ideas.' "Don't ever lose your generosity", he said. "We need leaders of integrity and courage. All of us are missionary disciples of Jesus." A special CYMFed award for most inspiring youth leader went to Bruno Gambini a much loved youth worker from Derby. You could probably walk into any parish within the city and people would smile on hearing his name. Those who work alongside him explain "Bruno doesn't see himself as a youth worker, yet the work he continually does with young people year after year is simply wonderful. Bruno doesn't see himself as a youth minister but the amount of young people who have stuck with their faith because of Bruno's gentle but powerful witness is amazing." Other awards were presented by Francis Campbell, Vice-Chancellor of St Mary's University, Liz Dodd from the Tablet, Margaret and Barry Mizen and their son George, Ellen Teague from the Columbans, Megan Russell from CAFOD and John Toryusen vice-chair of CYMFed. Also awarded on the evening was Tharanay Puvanachandran, who received the Cardinal Hume Award for living out the option for the poor. Tharanay attends St Dominic's Sixth Form College in Harrow. She works as a volunteer with street homeless and organises visits to care homes for people with dementia. As a practicing Hindu Tharanay has been insured by her faith to work to give back to the community and has been taught to help those in need. Among the award recipients was Ryan Earle, 19. As a member of the IMPACT and then Young Christian Workers groups in his parish, St Mary’s, West Croydon, Ryan came to understand the methodology of the YCW - SEE JUDGE ACT – and so became able to analyse problems affecting young people and carry out appropriate action in the light of faith. He grew in his leadership skills canvassing his local MP, and during the local elections co-chairing the Croydon Citizens Assembly, where he personally got the Labour and Conservative candidates for the council to publically commit to becoming a Living Wage employer. Following on from the assembly, the council pledged 50 work placements for Croydon’s young people. Ryan (pictured below) was presented with the Joseph Cardijn Award for the promotion of the dignity of workers. Aysha Ahmad, a student at Ursuline High School, Wimbledon was one of the people who received the Jimmy Mizen Award for promoting solidarity and peace. She is Muslim, and one day a young boy once spat in her face as an attack on her religious beliefs. This made decide to work to promote greater understanding and peace among different faiths in her school and the wider community. She is committed to the Catholic ethos of her school and has been able to share her own beliefs to build an atmosphere of unity in the community by identifying the many values that we all share in common. Aysha is pictured, with the other Jimmy Mizen Award recipients. The entire Year 7 class from Notre Dame Catholic College, Liverpool, won the Cardinal Hume award for their project, getting to know and support a school in Uganda The group raise money through sponsored silences, run a fair trade shop during lunch times and write letters to the children, making links and sharing their own experiences. Their teacher said: "It has been inspiring for me to watch a class of twelve year old children showing such ambition and drive to help other pupils in this way"
After the event, Danny Curtin, CEO and Co-Founder of Million Minutes said: "It was truly inspiring to meet and hear from the amazing young people transforming lives in their local communities. From the young family carer upholding human dignity, to the teenager promoting peace by leading the campaign to eliminate bullying, all the young people we met are living out the social teaching of the Church. Their commitment and drive is infectious, mixed with real humility. Million Minutes is looking forward to continuing the journey with them. We're very grateful for all those who got behind the Awards and supported them - here's to 2016!" 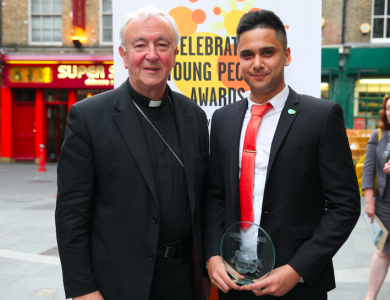 The ceremony brought together leading voluntary organisations and figures from the Catholic Church to recognise young people and youth workers whose contribution reflects the values of Catholic social teaching. Million Minutes hope that the awards also celebrate and inspire young people to get more involved in social action projects, as well as helping everyone to reflect on how Catholic social teaching can be lived out everyday. Francis Campbell, Vice-Chancellor of St Mary's University Twickenham said: "I am delighted that St Mary's supported this valuable event and congratulate the young people on their well-deserved awards. All the nominees are an inspiration and show how the timeless principles of Catholic social teaching remain relevant in homes and communities across Britain and the world. They are bringing light and hope to those who need it most, and St Mary's is proud to support Million Minutes and those committed to fostering the best of Catholic social teaching."